Bali Activity Enjoy the greatest nature in Ubud! Puri Experience run by a collaboration of Sayan Agung Village and the company. There are many great photo spots, so this tour is not only for people who want to try cycling or rafting! We are offering the special package of Cycling + Rafting in Ayung River + Balinese Dance! Because the price is super reasonable! ※Please prepare the tour fee without change. ・Meet the guide. Go over he safety operation of the bicycle. ・Cycling through rice terraces and forests. ・Take photo in the great nature! ・After checking-in, put the safety equipment. ・Leave the large bags in Darna transport Car which waits for you at the restaurant. ・Bring your camera and valuables with you. Going to start point by truck. Rafting Start. ・Put the camera and valuables in the waterproofed bag. ・Lecture about how to hold oars and calls. Rafting start. You can buy drinks at a small shop (soft drink Rp.20,000-) and take photos! Going by the water fall and the cave. Leave the boat once to pass a dam. ・Getting your bags that you left in Darna transport Car after arriving at the restaurant. ・Enjoy lunch buffet including drink (mineral water, coffee, tea) and dessert after shower and changing. ・Enjoy Balinese dance with the lunch at the restaurant. ・You can take photo with the dancers! Going to the start point by truck after checking in. View of the cave in the rafting course. Changing room, It is older and no curtain. Life jackets & helmets that you might think old, but no problem with the safty! Going to the start point by trucck. One boat can carry 6 people! Rafting through the forest! Enjoy the great nature! You can use the rental towel after the rafting. The water shower room with liquid soap which are divided individually. The restaurant is also a meeting place of the village which has a performance stage. Lunch Buffet. Soft Drink: Rp.10,000- & Beer: Rp.25,000- Enjoy the Balinese Dance during the lunch. You can take photos with the dancers! It about 10 hours. The extension is available by additional ＄14/hour. Can we change after we arrive at the reception? Can rafting guide speak English? Can many group go rafting at the same time? The one tour has 30 boats which means maximum 175 people can do rafting together. Can only children stay on the same boat? Children age 7-11 have to be with adults. The ones over age 12 can go rafting without adults, but the agreemtne by parents is required. You go rafting by the shoes with straps on the feel or bare foot. You have to take about 400 stairs on the way and about 290 stairs on the way back, so you can do them with the shoes and do rafting with bare foot. You will leave it in HIRO-Chan car. You can bring the valuables with you to the rafting. There is changing room and shower after rafting? You can take photos with the relief or at the break points and can buy the rafting photo by a photographar of Puri Experience (CD including 8 photos data/Rp.50,000). Please pay the fee to HIRO-Chan guide by Yen Cash . ※The insurance does not cover compensation for the belongings. I live in a big city of Tokyo. I was fascinated by the lush green scenery and the landscape of rural areas in Bali. 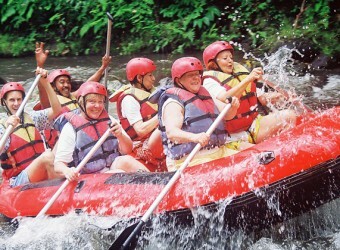 I fully enjoyed nature in Ubud by cycling and rafting! Although it is very cheap tour, but the tour was on a private car, not with other guests together in the same car.